WATERLOO: When my daughter and I first moved to 27 John Street in late October 2016 we were thrilled with having a balcony; somewhere to finally exercise my horticultural skills! There was very little in the way of a garden surrounding our ground floor flat at that point but I had some ideas … and several empty pots. 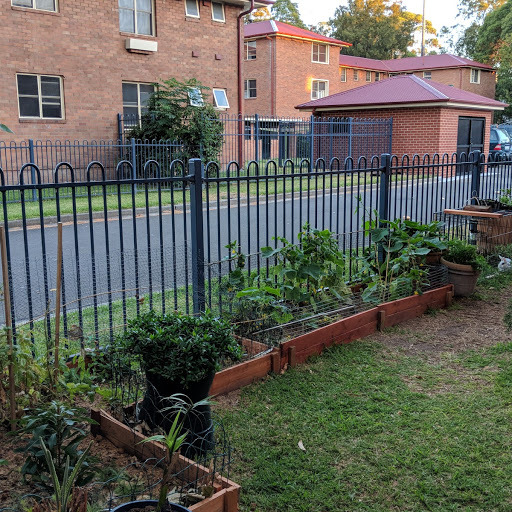 But this is not the story of just one person’s garden but of several households that joined together and made something wonderful out of a public housing brick and lawn wasteland. At the centre of our garden is a 30-year-old Frangipani tree – originally planted by a current resident’s grandmother! Like some of us it shows the passage of a long and sometimes difficult life in its gnarled and pitted trunk and scarred branches. It has survived scorching summers, storms, neglect and vandalism. However, like many of the residents here on John Street, it’s a survivor. The garden itself grew from a few pots along the wall of the walk leading up to the building. I asked some of the neighbours if they minded if I grew some flowers. 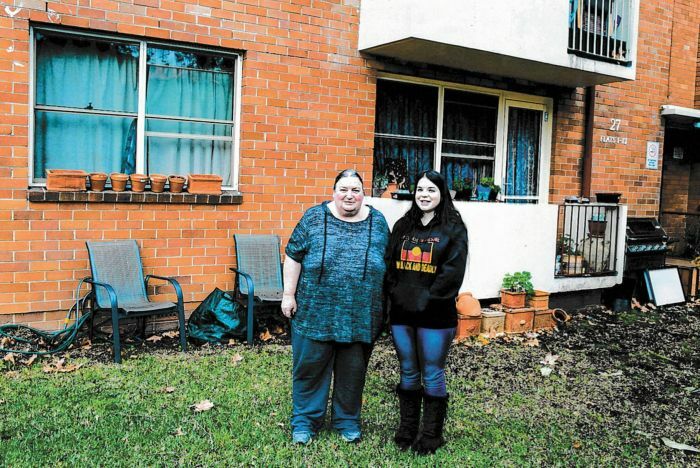 Some were non-committal, or cautious, making statements along the lines of “Housing’s not going to like that!” Gradually the garden spread out into several garden beds surrounding the perimeter and the windowsills of my unit and, as it did, so did the connections and friendships among other tenants. A feeling of community began to develop and take on a life of its own. Pots were found, pallets were broken up and turned into garden edging after being stained with decking oil rescued from a dumpster. People started working together. It wasn’t always smooth sailing, humans and animals made their presence felt: the wonderful Waterloo bunnies made their favourites known in the vegetable plot! 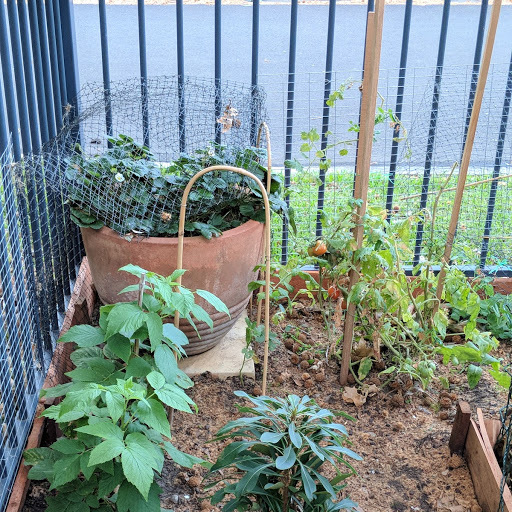 Despite this, the garden has continued to develop into an eclectic vision that represents the varied personalities and backgrounds of the participants. 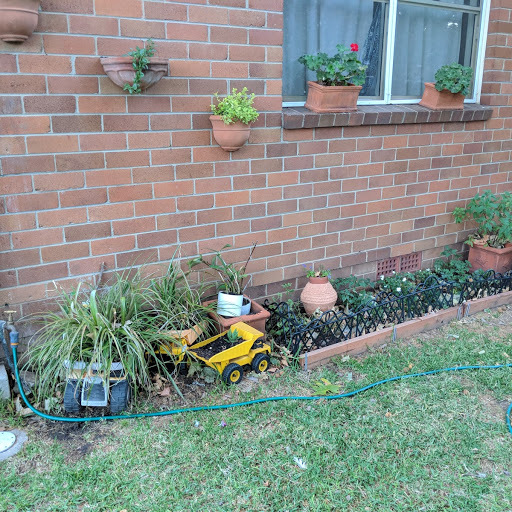 Paul’s use of recycled Tonka trucks to make planters for bromeliads; old pavers surround a found secondhand barbeque; a variety of vegetable choices, raspberry canes and many other small details are a reflection of the diverse personalities and backgrounds of the people who have helped to create something wonderful. The garden has given us a great deal of joy, and most importantly, it has given us a sense of permanence and unity, not just at 27 John Street but among many of our neighbours and passersby, who often stop by and admire whatever is flowering at the time. They stop, admire, and talk about their day, share problems and offer cuttings, seeds, netting, pots and other useful items. 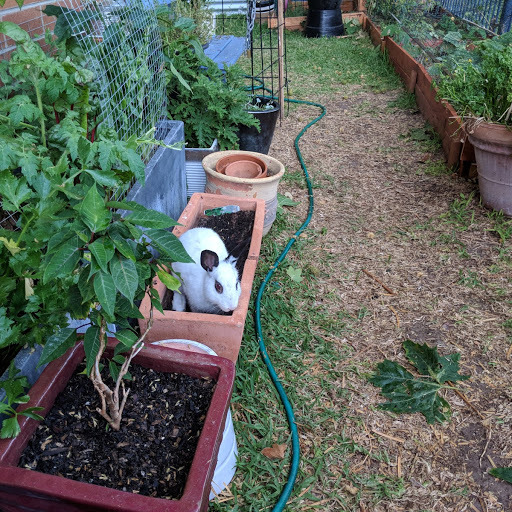 Many locals have had gardens or potted plants before with little success, and wonder that we have been lucky to have so little theft or damage. 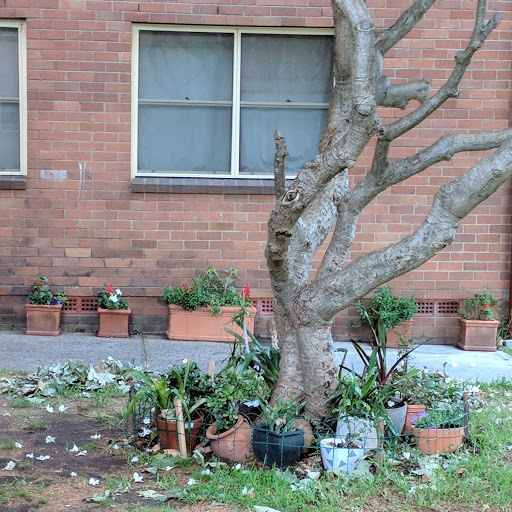 I can understand their concerns, but like the 30-year-old Frangipani tree, we are battlers. If it gets broken – we replace it, if it is getting eaten by bunnies – we put a netting around it; all problems are solvable with a little cooperation and ingenuity. The garden is unlike others in the area. Other than some netting and soil almost everything has been found, recycled, donated or sourced through Gumtree. Many of us are on pensions or other benefits and all are in similar situations. Nevertheless, the positives so outweigh any cost – we are a community. Nearly half our block is involved, we barbeque at least once a week, everyone chips in. The difference it has made is amazing and we are proud to have succeeded on our own. While aware that we may be moved away at some time in the near future, we all continue to develop and maintain what has become for us a labour of love. So, stop by for a chat, swap cuttings and seeds or simply come to admire the garden. It is always changing and adapting, much as we have to in our busy modern lives. Yes, there is a lot to be learnt from a garden!